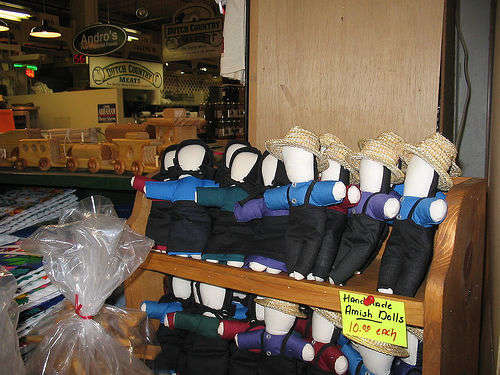 In Lancaster County, Pennsylvania, Amish dolls are popular among Amish children as well as a visitors to the region. These unique dolls tend to be rag dolls with the unusual characteristic being that they are not depicted with a face. It is not known for sure why these Amish toys are faceless. The most commonly accepted explanation is that the Amish religion prohibits Amish people from being photographed for fear that doing so would encourage vanity and other frowned upon behavior. 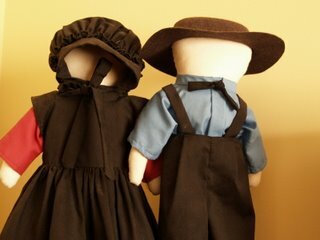 The dolls are always depicted with traditional Amish clothing. Amish children never have the option of dressing their dolls in exotic and colorful dresses, outfits, and bathing suits as is common with mainstream children dolls such as Barbie. Likewise, depicting these traditional Amish crafts sans face, discourages individuality over the common good of the Amish community. Contrary to this theory that the Amish religion is the cause for the dolls to be faceless, there have been found Amish dolls with faces sewn on or drawn on. These dolls date as far back as the early 1900s. Therefore, some experts of Lancaster County folk art, theorize that it was simply a common practice prior to 1900 to depict all rag dolls without a face ... regardless of cultural origin. Further evidence to support this belief is the fact that the original Raggedy Ann doll discovered by cartoonist Johnny Gruelle's daughter Marcella, did not have a face. It wasn't until Johnny Gruelle added a face to his title character Raggedy Ann in his popular and famous stories that he wrote in the early 20th century that the rag doll became commonly associated with having a face. Traditional Amish toys and dolls are very popular among the locals of Lancaster County as well as among tourists to Pennsylvania Dutch Country. Although the origin of the faceless rag doll may never be known for sure, they remain today associated with the culture of the Amish people. They remain popular with the local children as well as with visitors of Lancaster County, Pennsylvania.